‘All Aboard for Rushden’ is a new app that launched on Sunday 16 September and aims to encourage people walking the Greenway path between Rushden town centre and the new Rushden Lakes development to find out more about the former branch railway line and other interesting places to visit nearby in the town centre. The Heritage Lottery funded Nenescape Landscape Partnership Scheme has worked with the University of Nottingham’s Horizon Digital Economy Research team and Mixed Reality Lab to create a new piece of technology that sets a challenge of finding a series of pieces of art along the Greenway, with a reward on completion of a Rushden High Street discount voucher. Nenescape has facilitated the creation of the app by a group of local organisations, including Rushden Historical Transport Museum, Rushden Museum, the Greenway team, East Northamptonshire Council, Destination Nene Valley and Northampton University’s History department. 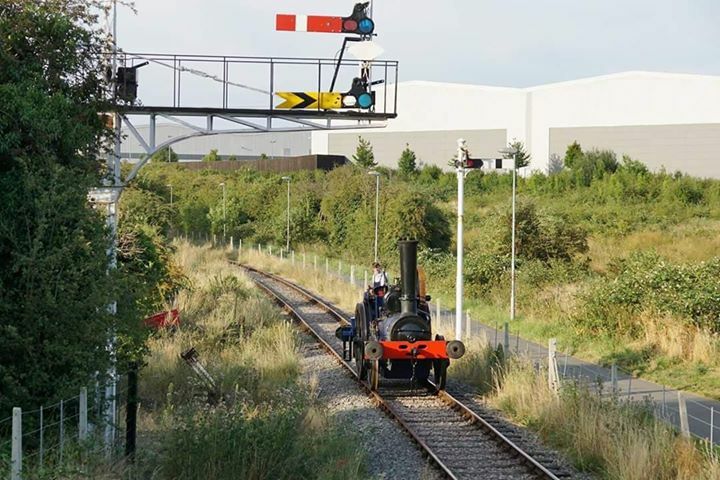 By following the story of a mail bag accident on a local railway in 1911 and the imagined contents of the bag, visitors can work their way along the former rail line finding out more about Rushden’s history. Visitors can find five pieces of art, with the stories and information in the app changing on a regular basis to showcase local events and new stories. Drawn by artist Michelle Barnett, the pieces of art depict cyclists on the Greenway with a traditional signal, bringing together the historic and current uses of the path. This app is just one element of a wider piece of work to reinvigorate the Greenway in Rushden and encourage more people to walk or cycle between Rushden Lakes and the town centre and beyond into the landscape. Another programme of work in the Nenescape scheme, Out to Water, Into History, is led by East Northamptonshire Council and will develop signage and improve the natural environment of the Greenway. Thanks to National Lottery players through the Heritage Lottery Fund, on Sunday 16 September the ‘All Aboard for Rushden’ app launched on the Apple and Google Play stores. Visitors can find the trail of art along the Greenway path between Crown Way and the High Street. Keep up to date with the project on social media @nenescape.